Pandora Katarina Gryffindor..I am Godric Gryffindor's, Grandaughter. Albus Dumbledore was my Godfather. He was like the father I never had. Devasted and now left alone and full of revenge, I hunt DE's and the Horcrux's to destroy them both. After graduating from Hogwarts I took a job as an auror. I was disgusted with the way they ran the Ministry and took my leave. I then... on Dumbledores orders left London and traveled around the world further educating myself on magic and the defence against the dark arts as well as studying other culture's in the magical world around the globe. Now called back by Dumbledore and finding it's time to put all I have learned into play, to protect the choosen one and rejoin the Order. I live in my inherited home of Godric Gryffindor's in Godrics Hollow. I traveled alot when I was younger to futher educate myself...education was a very big part of my life..one could compare me to Hermione as a young witch. Now 34 years old and trying to figure out where my life should take me, not knowing how to really live life. Always have been so into furthering her knowledge in preperation of the upcoming war.. I was born a soldier of the Order and will die one. ~Age: 24, but you'll never really know, as she is a Potions Mistress. Her true age is never revealed. ~Jobs: Ex. Auror, Ex Potion Mistress, Order of the Phoenix and Currently Head Mistress, Transfiguration prof..
~Animagus: Animagi-Black Panther with green eyes. ~ Social Status: Married to Hunter Niall, My Soulmate. He has my heart. I would die to save his life. I am totally devoted to my family and my close friends..whom all I adore. We a set of twins. 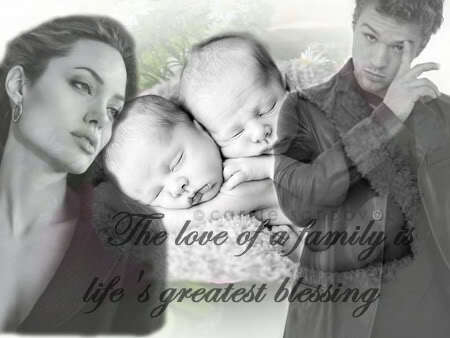 Linden and Isabella...they are our life. ~Personality: Honorable and very loyal and hard headed. Has a slight bad temper. She is not afraid to put herself in danger or a bad situation to save a friend. Do not be fooled by her kind heart and her beauty...she is a very fierce witch who can hold her own in any situation. And can have a terrible temper if she is hurt or betrayed. She protects all those that she loves and will diffiently kill over them. She's not beyond throwing the killing curse if she needs to. She will do what ever she has to in any situation and is smart enough to know what measure should be taken. But beware if you have hurt her or someone she loves. Your life may very well be in danger. ~Freinds: All of those in the Order. Best friend: Remus Lupin. ~Other: I have excelled in making potions. There is not a potion I cannot make. Due to my potion skills I am known as a healer to my friends. I have also worked at St Mungo's as a healer. I perfected potions when I was a student, so my friend Remus would never have to suffer another full moon. As she learned how to make the Wolfsbane potion earlier than most. Transifiguration is also one of my specialaties...having turned into a panther at a young age. For Hunter: "Everything I do...(I do it all for you.)"